Kingsdown Water are an Eco friendly carbon neutral producer of quality waters. Providing a premium brand ‘natural spring water’ that can be found in hotels, restaurants and bars in London and throughout the UK. Kingsdown Water was awarded Gold at the 2007 DBA Design Effectiveness Awards for their beautifully presented water. The production plant is nestled in the North Downs in the beautiful garden of England ie. Kent; just fifteen miles from the cathedral city of Canterbury. It would be an under statement to say that Kingsdown are proud of their water. A meeting with William Bomer the MD of Kingsdown will convince you of the water’s high quality and appeal. Indeed the water originates from a protected natural source. It is the chalk of the North Downs which provides the key to Kingsdown’s purity and quality. By acting as a huge natural filter it removes all impurities whilst ensuring that valuable trace elements are absorbed. The result is pure clean tasting spring water at its very best. Kingsdown’s proximity to London has enabled them to have the smallest carbon footprint of any British water delivered to London and the south east. Hence the tag line “London’s Local Water”. 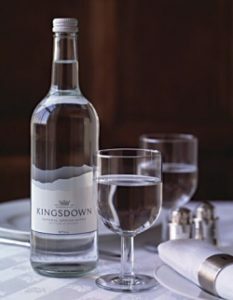 Since being established in 1995 Kingsdown have enjoyed meteoric success with their quality water. This has led to the need to invest in an higher speed, high efficiency, state of the art water bottling line. After much market investigation Enterprise Tondelli were selected to plan, project manage and supply the new production line. Enterprise were tasked with fitting the new line into the old bottling hall with minimum downtime and disruption. Also incorporating into the project schedule necessary civil works to provide an hygienic bottling environment. 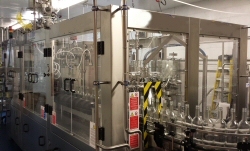 The new line consists of an Eurosistemi low level semi-automatic bulk glass de-palletiser, a rinser filler capper tri-bloc complete with an Arol capping turret suitable for filling still and carbonated waters, a compact Eurosistemi conveyor system & line control system and a Giemme pad & film shrinkwrapper. The labeller is re-used and a third party carbonator selected. The out put of the line is significantly increased over the previous line to 7000bph x 33cl and 4000bph x 75cl NRB glass. Also filled on the line are 1L glass bottles. A key objective was to have a highly efficient production line with reduced manning levels. Therefore many of the more onerous tasks are automated. De-palletiser. This machine is equipped with a large take-away conveyor table which can store more than 2 layers of bottles. This means that with the post de-palletiser conveyor accumulation the operator is only required 5/6 minutes to strip 2/3 layers. The benefit is that the operator is freed to carry out other tasks. Rinser Filler Capper. This machine is completely automatic featuring Siemens PLC control and HMI touch screen interface. The machine is also equipped with motorised height adjustment and other quick change-over features. From the start up very consistent levels in bottle have been achieved. Significant is the water feed arrangement which uses an inverter controlled pump to give a constant flow and pressure this was supplied with the filler. This has proved a real boon. Other important features of the machine are the completely stainless steel base frame and the gear to gear driving (an improvement on the cardan shaft with gearboxes method of driving) of the carousels. This results in reduced maintenance costs. Shrinkwrapper: The Giemme shrinkwrapper is equipped to produce 6, 12 & 24 bottle shrinkwrapped packs on flat boards or film only. The machine is completely Automatic also featuring Siemens PLC control and HMI touch screen interface. The machine automatically collates the bottles into the required format and loads these onto the flat boards or alternatively the collation can be film only. The collation is then wrapped, conveyed through the shrink tunnel and cooled ready for palletising. Conveyors and line control. Again in common with the other equipment a Siemens S7 PLC and touch screen HMI are used. In accord with good design practise the conveyors are designed to accumulate and buffer bottles to achieve the highest efficiency possible. The drives are all shaft mounted inverter controlled geared motors. Enterprise are very proud of the project delivered to Kingsdown and continue to work in partnership with both small and large producers. Enterprise are currently busy both in the UK and worldwide with projects for all sectors of the beverage industry. Including beers, ciders, spirits, waters, juices and soft drinks. From Manchester to Mongolia! Call us now for the solution to your current packaging challenge or requirement.